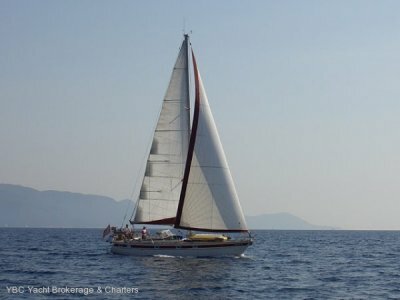 'Mintaka' is a classic long keeled double ended cruising yacht of the most traditional lines. 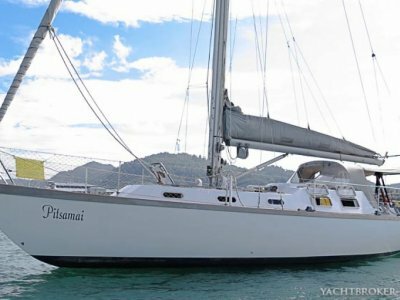 She is a very comfortable and surprisingly fast yacht with such appealing lines. Wide side decks, bordered by 7'' high bulwarks afford safe and easy movement and deck work forward. Built safely and simply, items such as the bronze worm drive steering highlight this yacht's strength and integrity. She had a complete refurb in 2013, inside and out. Topsides, decks and coachroof repainted. The interior was re worked, the forepeak converted from a workshop to a new double cabin and all interior paint and varnish renewed. Then in 2014 she had a complete bottom job, the hull taken right back to bare steel and it is still in prime condition. 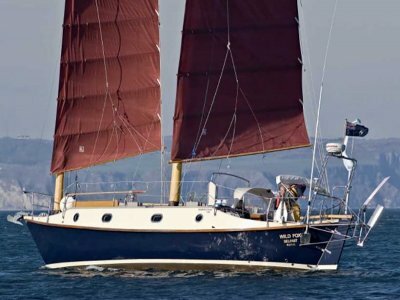 Now in 2017 she has recently received another good refit and stands in excellent condition. Full forward is the double cabin with pullman style berth. Moving aft, the saloon has a double folding leaf table with dining seating on the starboard settee. The nav. Station is to port and the heads to starboard. There is a quarter berth on the starboard side and to port is a sail and rope locker. Headroom is 6'7''. Lighting is a mixture of incandescent and kerosene lights. A stainless steel TAYLORS kerosene heater is bulkhead mounted in the saloon. One electric Jabsco. No holding tank. Stainless steel sink and vanity. TAYLORS kerosene two burner hob and oven. Single stainless steel sink, hand and foot pumped salt and fresh water. 50 litre 12volt fridge (new 2013). The yacht is served by it's DC system alone. House bank is 3 x 150amp wet cell batteries. 100amp engine battery. Charging from two 80watt solar panels, engine alternator and 30amp DH battery charger. 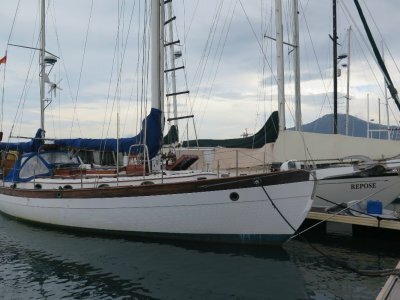 42' Oregon timber cutter ketch rig. Stainless steel standing rigging. Deck stepped, tabernacle main mast. Full height mast steps. Masthead tricolour.